I believe we have a program like the one you have identified. A nonprofit village concept with housing, food, education, job training, and a model were residents run their own village has been constructed in San Diego. Of course, programs only work with those who want change, temporary help, and individual improvement. I am very familiar and grateful for Father Joes Villages, also known as St. Vincent de Paul. It’s president, Father Joe Carroll, actually helped me over twenty years ago when we started our nonprofit, Nos Amis/Our Friends, Inc., Children Helping Poor and Homeless People (chphp.com). However, what I am suggesting is something different from Father Joe’s Villages. My suggestion is a self-sufficient village on a closed military base that would be run along the lines of a kibbutz and homeless people would be in charge of their own village. Also, homeless people would be invited to stay as long as they wanted, including their entire life, in their self-sufficient village. Finally, a home for an unlimited duration. This self-sufficient village would provide quick and relatively easy permanent housing with supportive services provided by nonprofit agencies. I feel this is the answer to the question of how do we end homelessness. Well then, let’s do it!! This is a dream I have had for quite some time but I seem to not have the money, time and expertise to do it. But let’s do it anyway! Now, where to begin? Here’s a thought. Let’s include the homeless in the planning. Absolutely, people of all economic status would be a vital part of creating the self-sufficient village. And I agree with you, let’s do it now. Stay tuned. Thanks for your comment. I do understand what you’re talking about. It’s tough these days to even find work, then the work may not be what we want or not what we are suited for and then there are family responsibilities. Tough. No question about it. Yet, despite how difficult it is for us housed people, it is even more difficult for those living without a home. The stress is enormous out there. Day after day, night after night with out hope. There is a reason that they have no hope – there is not enough help for those in need so even the strongest people out there, including former policemen and women, lawyers, master carpenters, etc., may turn to substances just to try to alleviate the pain. Of course, substance abuse of any kind does not help, but we can understand why any person, housed or unhoused, could turn to it. The answer? Do what we can to help those in more need than ourselves when we can do it. I carry dollar bills with me and when I’m out, I just say that I can’t help right now. I look forward to your further thoughts on this matter. Funny thing about being at the very bottom of the human food chain. You have nothing to lose. People who feel as if they have nothing to lose are invulnerable to the shame of debasement at the time. They may feel ashamed later, but the shame will be covered up by whatever mood altering device they chose to use. Begging from children, piece of cake. Thanks for your comment. A quick story. A lovely elderly gentleman, Sylvester, was working at a company that offered him early retirement with a severance package of $27,000. Sylvester opted to retire and put his severance pay in the bank. Unfortunately, soon after Sylvester’s son got in trouble and Sylvester used all of his retirement money and then some to help his son. As a result of his largess, Sylvester became homeless. I met Sylvester during the 6 months that he was riding the bus. After a considerable period of time, Sylvester explained that he was riding the bus all day every day because he was so embarrassed because he was homeless. Many of us service providers discussed how we could help this lovely gentleman. Eventually, Sylvester became housed again, helped many of us service providers and was featured in an Eddie Murphy movie! True story. 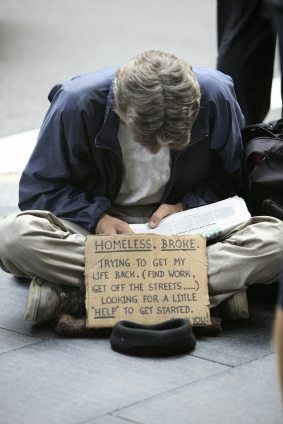 And there are many more stories about how embarrassing homelessness is to people. Hi Christine, I was at Von’s last week and I saw a very young man with a large backpack and a cat leashed to his neck. The cat rode on top of the backpack. I was not surprised as I myself had a cat for 18yrs, a cat which was equally amazing as she adapted to my unstable life over and over again. I went into Von’s and I thought I would get some cat food and drop it off where he was resting. As I was shopping I hoped he would still be there. I also thought, what would I do with cat food? So I opted to wait and see. As I was exiting the store I handed him some money and encouraged him to seek help from local agency’s. His only complaint was he had no official identification and the hoops he had to jump through were overwhelming for him. He also stated that he hated homeless people and would not seek help from a local shelter. I can say that, because I have done it. I too hated my homelessness. I too hated homeless people. I hated myself. My cat saved my life more than once. My point, I am catboy. I am very moved by your personal story. I understand how pets can be so very important – even life-saving. Although you don’t need congratulations from me, I do sincerely congratulate you for living the experiences you have and continuing. Congratulations! And thank you for your keen observations of the young man with the cat at Vons. I wish I had shared this with you before – we at the Center for Justice and Social Compassion (cjschomelesslaw.org) do help homeless people get their ID. CJSC works on Saturday mornings (except not this Saturday, 2/11) from 8am – 10:30am at the Episcopal Church Center at Sunset Cliffs Blvd and Brighton. Can you find the young man again and tell him of our services? We haven’t really done any advertising because we need funding. However, as we apply for grants, we’re doing the work. CJSC helps homeless people get certified copies of birth certificates, offers a $7 voucher for DMV CA photo ID and help with getting Social Security cards. I am sorry that you feel the way you do about homeless people.I understand that some can be rude and demanding.But isn’t that just a reflection on society as a whole?We deal with rudeness everyday from people who are not homeless. What bothers me is that I think we have lost our capacity for compassion.You may think that bad things will never happen to you, but they do.And you might find yourself in a similar situation….having to beg. I understand times are tough, and you are by no means required to give these people money.But remember not of all them are beggars.Not all of them addicts. Some of them just might be your neighbors. As for the catboy…I saw him yesterday in La Mesa.He was getting money to leave town.Yes he told me he had no I,D., but that he is homeless by choice.He enjoys traveling.But he took another young homeless man to the library to help him get started on looking for a job, after giving him some of his money. That it seems to me is how it should work.He had some good fortune, and he passed it along.The other young homeless man, is a recent Iraqi vet.Clean cut and very polite.His sign clearly stated that he was looking for a job, but would accept assistance.He got it in the form of another homeless person. Thanks for your comment. And thanks up the update about carboy. Wherever he goes, he will need ID, so our offer stands to help him get ID. We, Center for Justice and Social Compassion, do forward ID to homeless people at their new location. We’ve found that sometimes homeless people just keep moving because they can’t get help. Many thanks for spreading the word. Thanks for all you do for others. Please stay in touch and let me know how it goes. Thank you. ***STANDING OVATION*** to Christine….We need more compassionate, kind and generous souls like you in this world. I agree that there is no need to come down on those who are already down on their luck by choice or hapistance. I truly had not even a dime on me the other day after hitting Farmers Market and this sweet girl (who I at first, mistook for a boy) told me she was creating love on the sidewalk and could I spare any change. Avoiding eye contact, I told her I had nothing and you know what she said, “Many blessings for acknowledging me.” I stopped in my tracks, struck by how rude avoiding eye contact had been. I turned around, made eye contact with her and told her, “Many blessing to you too Mama.” The smile we shared made me feel like a million dollars. How simple and pure! I agree to your response regarding rude people–the glass is half full–most people who ask for change are good but in a difficult circumstance. We can definitely learn a thing or two by taking the time to acknowledge that by the grace of God, we are in a better situation than them, and to give them compassion (and as I learned, at least eye contact) if we can’t or don’t want to give money. Thank for your comment. And thank you for your kind words. However, it is you who I thank for reflecting upon the exchange you had with that young girl and for your response to acknowledge her! Great job, OBCindi! Please keep it up and keep in touch! Here’s the thread, yahoo. I saw catboy today. He is indeed trying to get out of town. He took the paper I had written the church address upon, and if he kept it I don’t know, not worried about it. I briefly mentioned my homelessness, my cat and then petted Chaos his cat. Then I went about my business. I have no control, I seek no control, I am blessed to have me a cool black cat. Thanks for your comment. And thanks so much for following through by giving the church address to carboy. I feel that your attitude is perfect. We do what we can do, and you’ve done that, and go on to help the next person, which I’m sure you will do. Older Article: Privatization in Mexico resulted in the deaths of 48 children.